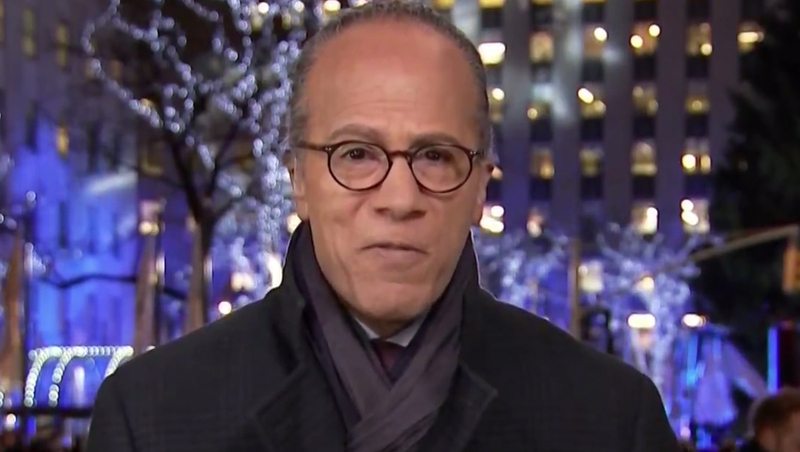 “NBC Nightly News” anchor Lester Holt moved outside for the final block of the broadcast Wednesday, Nov. 28, 2018 to cover the Rockefeller Center Christmas tree’s new star. NBC, whose headquarters is located directly behind the famous Christmas tree, holds the broadcast rights to music and dance filled special leading up to the lighting of the tree, which aired later Wednesday evening. The package, from NBC correspondent Harry Smith, focused on the new star perched atop the Christmas tree — while also serving as a cross-promotion for the network’s special. In the original rotation, “Snapshot” aired on Tuesday nights, while “Spotlight” normally ends Thursday broadcasts. Wednesday would normally be a “Those Who Serve” package. However, the schedule is not always followed consistently — and some broadcasts forgo using one at all. The story was heavily promoted in both the teases before the show and another before going to a break. Interestingly, earlier this month, “Nightly” did the reverse — had Holt start outdoors before coming back inside — for winter weather coverage.